I am new to vintage Breitling watches & would much appreciate some guidance/help. Previously I have only dealt with vintage rolex & omega watches, thus a newbie to Breitling. I came across a vintage Breitling chrono but I’m couldn’t quite verify/check it online. Maybe someone knows what model this is or if it some funny combination? Not sure if it’s good too nice to be true. And in case it’s an actual model, what the appropriate price range would be? I attached a photo. The closest I found online was either a 1950s premier or the Arbitro 2, but as mine is a all numeric I got a bit suspicious. suspicious with good reason, dial is at least a refinish and I do not recognize the case ..
post a pic of the caseback markings, we’ll know more then. Thank you for your help. So not good news I guess. I have attached a picture of the movement, which might help. caseback please, as stated above. Sorry, I hope this helps. What does redial refer to/what does it mean? The new dial? How would you value such a watch? Or should I keep my hands off? redial means the dial has been re-painted - making the watch much less valuable from a collector‘s standpoint , but no reason not to wear it if you like it as it is. Thank you for your help. Just for future reference, what were the strongest indicators for you to spot the redial, specific factors or rather the whole watch as such? Breitling moved to Geneva in 1952 so Geneve wouldn't be on a watch that dates to 1946. That's the other problem I have with it. The style watch is indicative of a 1950's Breitling yet the serial number appears to date it to 1946. The pic is from the 1953 catalog. assume typo in Paul's post above, pic is from the 1946 catalog. Got that from Richter, page 107. which says 1953 so it's an error? 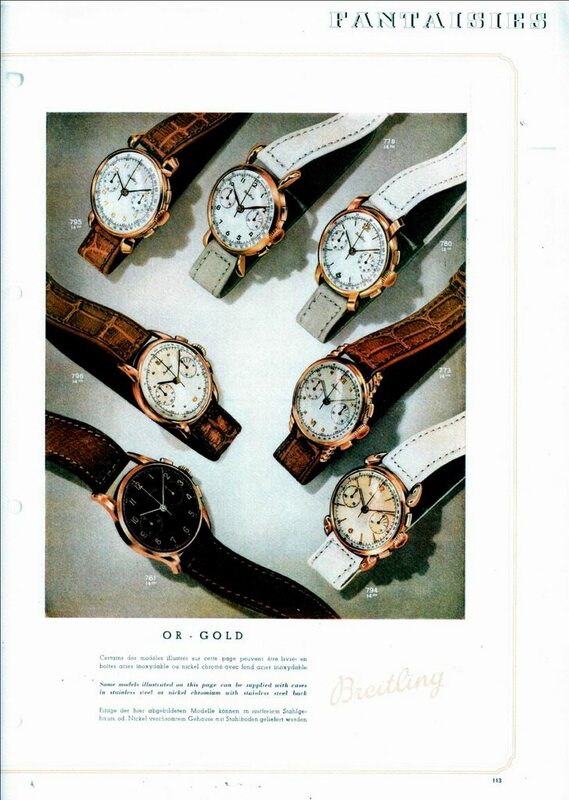 yes, this is a page from the 1946 catalog, move to Geneva was 1953 btw. That would explain the serial number then. As for the date of the move I've always understood it was 1952 with Geneve on the dial starting in 1953.